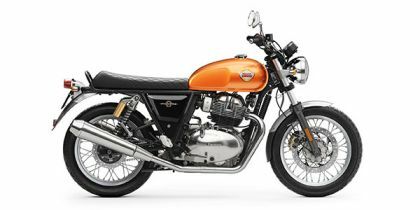 Royal Enfield Interceptor 650 price in Delhi starts from Rs. 2.51 lakh (Ex-showroom). Interceptor 650 is available in only 1 variant. Royal Enfield Interceptor 650's top competitors are Royal Enfield Continental GT 650 (price starting at Rs. 2.66 lakh in Delhi) and Bajaj Dominar 400 (price starting at Rs. 1.64 lakh in Delhi). Q. How much cost of every 10000 km service maintenance? Q. What will be the price differences in colour scheme of RE Interceptor 650? It would be difficult to give any verdict here as it hasn't been launched. So, we would suggest you to wait till its launch. Q. Is this a budget friendly bike? If you are comparing it with other RE models, then the answer is No! But if you are comparing it with it's competitors, then it is definitely a budget friendly bike. Q. My height is 5.4 feet, I am confused between Interceptor and Dominar 400, my daily commute is around 15 to 20 kilometers per day and in weekend will go for 50 to 60 kilometers. What is it's performance and maintainance in city traffic? Well service cost lesser than rest RE Models . Service interval is every 10,000 km only. Warranty is 40,000 km or 4 years.